Background: Older persons are overwhelmed with psychological stressors due to requirements related to the management of their health problems. The purpose of this study was to investigate physical, psychological and social wellbeing of older persons. Method: Cross-sectional explorative design used convenience sample of 1058 older persons in Jordan. Data was collected in regard to physical, psychological and social wellbeing using selfreported format. Results: The three most bothered physical symptoms are; pain in arms, legs, or joints; feeling tired or having low energy; and back pain with percentages of 71.5% (n=756), 69.6% (n=737), and 62.2% (n=754), respectively. Older persons had slight to mild level of depression (M = 17.9, SD = 7.7), moderate to high level of life satisfaction (M=24.1, SD=5.6), moderate level perception of social support, and mild to moderate level psychological distress (M = 39.1 (SD = 11.3). Depression among participants has significant and positive association with sleep disturbance (r = .21, p < .001), psychological distress level (r =.50, p <.001). There was a significant difference between males and females in depression (t = -4.40, p <.001), psychological distress (t = -3.38, p <.001), life satisfaction (t = 2.09, p = .04) and sleep disturbances (t = -2.16, p = .03). Conclusion: Older persons are in need for periodic assessment for their psychosocial wellbeing in their routine checkups and visits to outpatients units. Research is needed to investigate impact of psychological and social wellbeing on other biological and health care related issues such as access and utilization of care and quality of life among older persons. 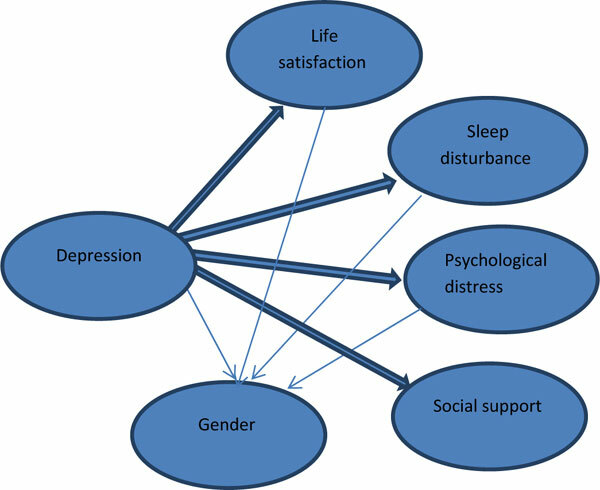 Keywords: Older person, depression, stress, life satisfaction, sleep disturbances, social support. Keywords:Older person, depression, stress, life satisfaction, sleep disturbances, social support. Abstract:Background: Older persons are overwhelmed with psychological stressors due to requirements related to the management of their health problems. The purpose of this study was to investigate physical, psychological and social wellbeing of older persons.